Every year, towards the end of the school year in March, Mayo College Girls. School sends all its girls, with the exception of the board classes, to a very exciting, recreational and educational excursion trip, what the girls. call- .Mid-Term Trip.. After a long and strenuous round of the final examinations, this much needed week- long trip to various destinations in India is cherished by all. All arrangements, which include travel, lodging and the various activities, are managed by the school. The girls indulge in a number of adventurous activities like trekking, rafting, rock-climbing, kayaking, etc. Alongside the adventurous activities, educational tours to various forts, museums, wildlife sanctuaries and eco-friendly villages etc. also form a very integral part of the trips. At times, our senior girls of class 11th have given up their leisure and have lent a helping hand by doing social work for the victims of the various natural disasters like that of the Bhuj Earthquake in Gujarat, Tsunami in Chennai, and for the unprivileged children of Seva Niketan in Port Blair in the Andaman & Nicobar Islands. Mid-term excursion trips are not only a learning exposure to the girls but also a great learning experience for the teachers who accompany them. They encourage student-teacher interactions outside the classrooms which help to develop a better relationship of understanding between the students and teachers. 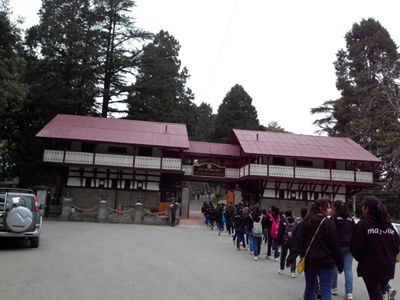 These excursions also help to bring out organizing skills and other such capabilities in the girls. After enjoying a whole week of fun and leisure, the girls return back with a fresh mind and renewed vigor to start a new class and spring term of April.